This article is about the book by Dr. Seuss. For other uses, see How the Grinch Stole Christmas (disambiguation). How the Grinch Stole Christmas! is a children's story by Theodor "Dr. Seuss" Geisel written in rhymed verse with illustrations by the author. It follows the Grinch, a grouchy, solitary creature who attempts to put an end to Christmas by stealing Christmas-themed items from the homes of the nearby town Whoville on Christmas Eve. Despite his efforts, Whoville's inhabitants still celebrate the holiday, so the Grinch returns everything that he stole and is the guest of honor at the Whos' Christmas dinner. The story was published as a book by Random House in 1957, and at approximately the same time in an issue of Redbook. The book criticizes the commercialization of Christmas. Based on a 2007 online poll, the National Education Association named it one of its "Teachers' Top 100 Books for Children". In 2012 it was ranked number 61 among the "Top 100 Picture Books" in a survey published by School Library Journal – the fourth of five Dr. Seuss books on the list. 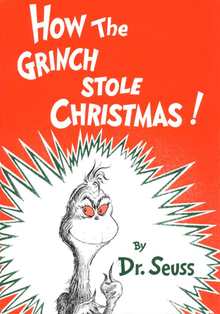 The book was adapted as a Christmas special twice, a 1966 animated TV movie starring Boris Karloff as both the narrator and the voice of the Grinch and a 2000 live-action feature film starring Jim Carrey. The Grinch is a bitter, grouchy, cave-dwelling green monster with a heart "two sizes too small" who lives on snowy Mount Crumpit, a steep high mountain just north of the town of Whoville, home of the merry and warm-hearted Whos. His only companion is his unloved, but loyal dog, Max. From his cave, the Grinch can hear the noisy Christmas festivities that take place in Whoville. Annoyed, he decides to stop Christmas from coming by stealing their presents, trees, and food for their Christmas feast. He crudely disguises himself as Santa Claus, and forces Max, disguised as a reindeer, to drag a sleigh to Whoville. Once there, the Grinch slides down the chimney and steals all of the Whos' Christmas presents, the Christmas tree, and the log for their fire. He is briefly interrupted in his burglary by Cindy Lou, a little Who girl, but concocts a crafty lie to effect his escape from her home. The Grinch then takes his sleigh to the top of Mount Crumpit, and prepares to dump all of the presents into the abyss. As dawn breaks, he expects to hear the Whos' bitter and sorrowful cries, but is confused to hear them singing a joyous Christmas song instead. He puzzles for a moment until it dawns on him that "maybe Christmas, perhaps, means a little bit more" than just presents and feasting. The Grinch's shrunken heart suddenly grows three sizes larger. The reformed Grinch returns all of the Whos' presents and trimmings and is warmly invited to the Whos' feast, where he has the honor of carving the Roast Beast. Dr. Seuss working on How the Grinch Stole Christmas! in early 1957. "I got hung up getting the Grinch out of the mess. I got into a situation where I sounded like a second-rate preacher or some biblical truisim... Finally in desperation... without making any statement whatever, I showed the Grinch and the Whos together at the table, and made a pun of the Grinch carving the 'roast beast.' ... I had gone through thousands of religious choices, and then after three months it came out like that." By mid-May 1957, the book was finished and in the mail to the Random House offices in New York. In June, the Geisels took a month-long vacation to Hawaii, where he checked and returned the book's galley proof. The book debuted in December 1957, in both a book version published by Random House and in an issue of Redbook magazine. Geisel dedicated the book to Theodor "Teddy" Owens, the one-year-old son of his niece, Peggy Owens. "Even if you prefer Dr. Seuss in a purely antic mood, you must admit that if there's a moral to be pointed out, no one can do it more gaily. The reader is swept along by the ebullient rhymes and the weirdly zany pictures until he is limp with relief when the Grinch reforms and, like the latter, mellow with good feelings." The review for The Saturday Review of Literature stated: "The inimitable Dr. Seuss has brought off a fresh triumph in his new picture book... The verse is as lively and the pages are as bright and colorful as anyone could wish." The reviewer suggested that parents and older siblings reading the book to young children would also enjoy its moral and humor. Charlotte Jackson of the San Francisco Chronicle called the book "wonderful fantasy, in the true Dr. Seuss manner, with pictures in the Christmas colors." Some writers, including Dr. Seuss himself, have made a connection between the Grinch and Dr. Seuss. In the story, the Grinch laments that he has had to put up with the Whos' celebration of Christmas for 53 years. 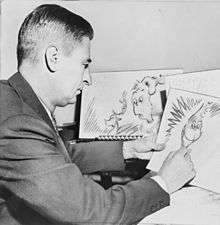 As both Thomas Fensch and Charles Cohen note, Dr. Seuss was 53 when he wrote and published the book. Dr. Seuss himself asserted the connection in an article in the December 1957 edition of Redbook: "I was brushing my teeth on the morning of the 26th of last December when I noticed a very Grinch-ish countenance in the mirror. It was Seuss! So I wrote about my sour friend, the Grinch, to see if I could rediscover something about Christmas that obviously I'd lost." Seuss's step-daughter, Lark Dimond-Cates, stated in a speech in 2003, "I always thought the Cat... was Ted on his good days, and the Grinch was Ted on his bad days." Cohen notes that Seuss drove a car with a license plate that read "GRINCH". Thomas Fensch notes that the Grinch is the first adult and the first villain to be a main character in a Dr. Seuss book. Chuck Jones famously adapted the story as an animated special in 1966, featuring narration by Boris Karloff, who also provided the Grinch's voice, and songs with lyrics written by Geisel himself, set to music composed by Albert Hague, many of which were sung by Thurl Ravenscroft. In 1975, Zero Mostel narrated an LP record of the story. In 1992, Random House Home Video released an updated animated version of the book narrated by Walter Matthau. The book was translated into Latin as Quomodo Invidiosulus Nomine Grinchus Christi Natalem Abrogaverit: How the Grinch Stole Christmas in Latin by Jennifer Morrish Tunberg with the assistance of Terence O. Tunberg. The translation was published in October 1998 by Bolchazy-Carducci Publishers Inc.
A musical stage version was produced by the Old Globe Theatre, San Diego, in 1998. It also was produced on Broadway and a limited-engagement US tour in 2008. The North American Tour began in the fall of 2010 and has subsequently toured every fall since. It will begin its 6th tour in October 2015. An audiobook of the book read by Rik Mayall was released in 1999. The book was adapted into a 2000 live-action film, directed by Ron Howard starring Jim Carrey as the Grinch. The book was adapted into a 13-minute song, performed by the Boston Pops Orchestra, arranged by Danny Troob, and featuring bassist Reid Burton and actor Will LeBow narrating it on the Boston Pops's 2013 CD, "A Boston Pops Christmas---Live from Symphony Hall with Keith Lockhart". The Grinch character was reprised in Seuss's Halloween Is Grinch Night and The Grinch Grinches the Cat in the Hat and he and Max also appear in the children's show, The Wubbulous World of Dr. Seuss. In 2009, an interactive e-book version was released for the iPhone. Illumination Entertainment is developing a 3D animated feature film, titled How the Grinch Stole Christmas with Peter Candeland and Yarrow Cheney set to direct it and Benedict Cumberbatch voicing the character. It was originally scheduled to be released on November 10, 2017, but in June 2016, it was pushed back to November 9, 2018. ↑ Zielinski, Stan (2006-06-20). "Collecting Children's Picturebooks: Dr. Seuss — Redbook Magazine Original Stories". 1stedition.net. Retrieved 2010-09-09. ↑ Nel 2004, p. 130. ↑ National Education Association (2007). "Teachers' Top 100 Books for Children". Retrieved August 19, 2012. ↑ Bird, Elizabeth (July 6, 2012). "Top 100 Picture Books Poll Results". A Fuse #8 Production. Blog. School Library Journal (blog.schoollibraryjournal.com). Retrieved August 19, 2012. 1 2 3 4 5 Morgan 1995, p. 157–158. ↑ MacDonald 1988, p. 92. ↑ Nel 2004, p. 118. 1 2 3 4 5 6 7 Fensch 2001, p. 128–129. 1 2 Fensch 2001, p. 126. 1 2 Cohen 2004, p. 330. ↑ Reardon, Patrick (15 December 1998). "How the Grinch Went Latin". Chicago Tribune. Retrieved 9 March 2015. ↑ "How the Grinch Stole Christmas". Box Office Mojo. Retrieved 9 March 2015. ↑ Broida, Rick. "'How the Grinch Stole Christmas' dazzles on iPhone". Cnet. Retrieved 4 December 2013. ↑ Kit, Borys (February 7, 2013). "'How the Grinch Stole Christmas' Remake in the Works at Universal". The Hollywood Reporter. Retrieved February 7, 2013. ↑ Kroll, Justin (April 13, 2016). "Benedict Cumberbatch to Voice the Grinch in 'How the Grinch Stole Christmas'". Variety. ↑ "Universal Dates 'Despicable Me 3,' New 'Grinch Who Stole Christmas'". The Hollywood Reporter. 2011-11-17. Retrieved 2014-01-16. ↑ Kroll, Justin (June 7, 2016). "Illumination's 'The Grinch' Pushed Back to 2018". Variety. Retrieved June 7, 2016. Cohen, Charles (2004). The Seuss, the Whole Seuss, and Nothing But the Seuss: A Visual Biography of Theodor Seuss Geisel. Random House. ISBN 978-0375822483. Morgan, Neil; Morgan, Judith Giles (1996). Dr. Seuss and Mr. Geisel: a biography. New York: Da Capo Press. ISBN 978-0-306-80736-7. Grinch at Don Markstein's Toonopedia. Archived from the original on February 5, 2016.